Education Secretary Betsy DeVos waits to testify before the House Appropriations Committee on Capitol Hill. Democrats got their shot at Education Secretary Betsy DeVos on Tuesday, when she testified before a House committee about her department's proposed budget. The hearing followed widespread criticism of DeVos for lackluster performances on 60 Minutes and the Today show earlier this month. She remains one of the most unpopular members of President Trump's Cabinet and continues to anger Democrats over many issues. Republicans at the hearing, not surprisingly, were more supportive, praising DeVos for her efforts to shrink the size of the federal bureaucracy, her support for charter schools and vouchers, and for her stance that states should decide whether teachers should carry guns. But from Democrats, there was criticism — and scorn. Rep. Rosa DeLauro, D-Conn., started off by taking aim at DeVos' proposed 5 percent cut in education spending for 2019. "You are turning your back on public schools," DeLauro said. "You admitted in your interview on 60 Minutes that you have yet to visit a single struggling school and said you support arming teachers, an idea most teachers oppose." DeVos insisted that arming teachers should be left up to the states and local school districts. She said she hasn't visited struggling schools because she is afraid she wouldn't be welcome. She said she has focused instead on schools that are doing innovative things and are more welcoming. DeLauro piled on the criticisms: "You stand up for debt collectors rather than college students struggling to pay back loans. You favor reducing government oversight of private, for-profit schools with bad track records. You're undermining sexual assault policies on college campuses." DeVos seemed unruffled, smiling as she tried to get back to a discussion about the budget, especially her push to help low-income parents pay for private school tuition. Rep. Nita Lowey, a New York Democrat, was next: "Your budget includes over a billion dollars more for school choice," she told DeVos. "But no new money for special education." Lowey accused DeVos of not caring that some private schools aren't following federal laws that are supposed to protect children with disabilities. "We are working to make sure private schools follow those laws," DeVos responded. "But it's a state matter if a school has its own programs that the Individuals with Disabilities Education Act does not cover or fund." "Wait," Lowey interrupted, "you're saying the feds have no role in making sure parents get services that IDEA calls for? So if parents put a child in a school that does not serve that child, that's OK?" Returning to her budget proposal, the secretary said it has two main goals: first, to make the department more efficient by doing more with less, and, second, to reduce the federal footprint on state and local school reform. To that end, DeVos wants to slash the budget, mostly by cutting $2 billion from teacher training and professional development programs. She suggested that school districts could replace that money by taking funds from other federal programs. "That's preposterous!" said Rep. Lucille Roybal-Allard, a California Democrat. "You're robbing Peter to pay Paul," agreed Democrat Barbara Lee, also of California. Lee accused DeVos of rolling back protections for the rights of minority students. 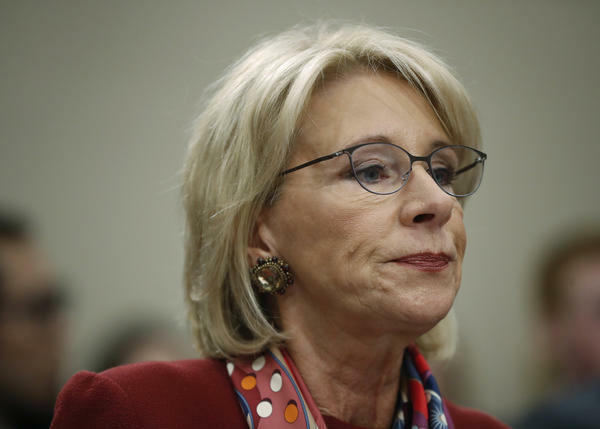 She noted DeVos' proposal to reduce funding for the department's Office for Civil Rights and the administration's support for a rollback of Obama-era guidance on racial disparity in suspensions and expulsions. Years of research show that African-American and Latino students are punished more often and more harshly than white students for the same violations. "Do you admit there's racial bias? Yes or no?" Lee asked. "We don't tolerate discrimination," DeVos responded. "The office of civil rights is doing more with less. It's more efficient than before. Our budget protects and encourages minority students. It expands opportunities that target minority low-income students." "Your head is in the sand," Lee retorted. "You just don't care about civil rights do you?" Rep. Andy Harris, R-Md., came to DeVos' defense. "It's shameful that you're being accused of being racist just because people don't agree with you," he told her. On guns and arming teachers, DeVos had little to add beyond what she has said previously: It's an issue best left to states. Although DeVos went to Florida after the Parkland shooting, Rep. Mark Pocan, a Wisconsin Democrat, wanted to know: "Will you at least be willing to meet with students from [Marjory] Stoneman Douglas High School, who'll be marching this Saturday in Washington?" "Yes," DeVos said. "But at some other time." Trump has named DeVos to head a new commission on school safety. She told the lawmakers that the panel will examine the "culture of violence" in the U.S.
After more than two hours of testimony and repeated attacks from Democrats, Rep. Rodney Frelinghuysen, R-N.J., stated the obvious: "There's a disconnect between you and lawmakers."